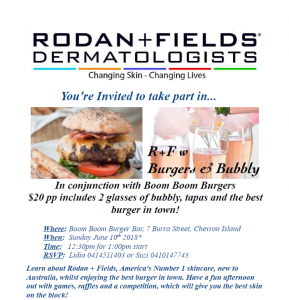 You’re invited to join Rodan + Fields, America’s Number 1 skincare for a delicious lunch from Boom boom burgers and bubbly’s! Learn about Roand + Fields whilst enjoying the best burgers in town. Have a fun afternoon out with games, raffles and a competition, which will give you the best skin on the block! In conjunction with Boom Boom Burgers, $20pp includes 2 glasses of bubble, tapas and the best burger in town! Payment required with booking or $25pp at the door.